A couple headed to their destination wedding in Costa Rica was removed from their United Airlines flight Saturday, reports ABC affiliate News 13. Michael Hohl and fiancé Amber Maxwell had a layover in Houston, Texas following a flight from Salt Lake City. When they boarded the next flight, they claim a man was sleeping across their assigned seats. Instead of waking him and because the flight was not full, they grabbed a pair seats a few rows closer to the front of the plane. “We thought, 'not a big deal.' It’s not like we are trying to jump up into a first-class seat," said Hohl. “We were simply in an economy row a few rows above our economy seat.” When a flight attendant approached, they explained why they weren't in their assigned seats and asked for an upgrade. The flight attendant declined the upgrade and the couple returned to their original seats. After complying with the flight attendant, they were approached by a marshal who said they had to deplane. Without fully comprehending the reason, they exited the plane. "They said that we were being disorderly and a hazard to the rest of the flight, to the safety of the other customers," Hohl told KHOU-TV. However, United's account of the story is notably different. The Airline says the couple tried to get upgraded seats "repeatedly" and "wouldn't follow crew instructions." "We’re disappointed anytime a customer has an experience that doesn’t measure up to their expectations," the airline said in a statement. "These passengers repeatedly attempted to sit in upgraded seating which they did not purchase and they would not follow crew instructions to return to their assigned seats. We’ve been in touch with them and have rebooked them on flights tomorrow." The couple allegedly took seats in Economy Plus and were offered the option to pay the difference in ticket prices, but declined to pay for the upgrade. A United spokesperson told Mashable there was no air marshal involved and the couple followed crew orders while exiting the aircraft. United offered the couple a discounted hotel stay and had them on a new flight Sunday. Michael Gallagher, stepfather of the bride, told KUTV in Utah, "Truthfully, we all worried that maybe something would happen in Costa Rica, and we were willing to deal with that. Never in our wildest dreams did we think United was going to screw it up in Houston, Texas." While the stories don't exactly match up, the couple should not miss their wedding, which is scheduled for Thursday. 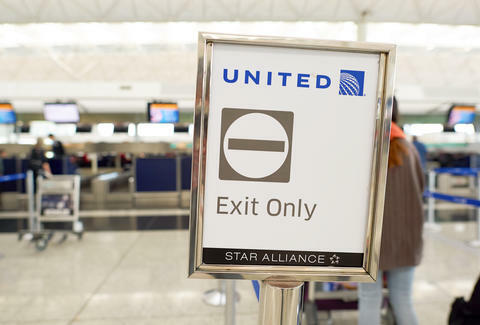 For United, this story follows a recent leggings controversy and a passenger being dragged from a flight, allegedly causing a concussion, broken nose, and other injuries. To combat image problems and correct issues from the latter story, the airline has announced a more passenger-friendly policy on overbooked flights and has promised to announce more changes this month following a review of the Dr. David Dao situation.